The latest iteration of the Service Manual is now published. The Service Manual exists to help people across government build services that meet the Digital Service Standard and prepare for service assessments. Over the past year, we’ve built a new front end and created or updated more than 150 pages. We’ve just added a new homepage. We’ve made all of these improvements gradually. In September we wrote about some of the work we did earlier in the year. Now, we want to share what the latest steps have been. What we’ve done has given us a great base to build on, but it’s just the start. We’ve already started improving content and we’ll continue to do so based on analytics, user research and feedback, and the help we get from experts. We know that every service is different, and the manual can’t just explain how to build a service in a one-size-fits-all way. GDS wants to support government to build great services and we want the Service Manual to play a part in this. The Service Manual is for the benefit of service teams across government. With your help, we can make sure it keeps improving. As we iterate the manual, we want to hear from you. There is a feedback option at the bottom of every page of the Service Manual. You can also leave a comment below to let us know what you think about the changes. One aspect of moving off github which will be missed is the opportunity of open discussions around changes or proposed changes. Thank you for this feedback, Matthew. Content in the Service Manual is written by our communities of practice. Research at alpha showed that discussions about content usually happen away from the Service Manual and GitHub itself, before consensus is reached and guidance is published in the manual. You can find out how to get involved in these discussions via the community pages in the manual. As a gov supplier, this was very useful for watching and receiving notifications of changes to the manual, but I get the impression that github repo may be defunct now? if so, are you managing via another repo? We're no longer using Github to manage the content of the Service Manual. However, you can subscribe to receive email alerts whenever guides are added or updated. To do this, go to the topic that you're interested in and sign up to 'Get notifications' on the right hand side. All the topics are listed on the Service Manual homepage (https://www.gov.uk/service-manual). 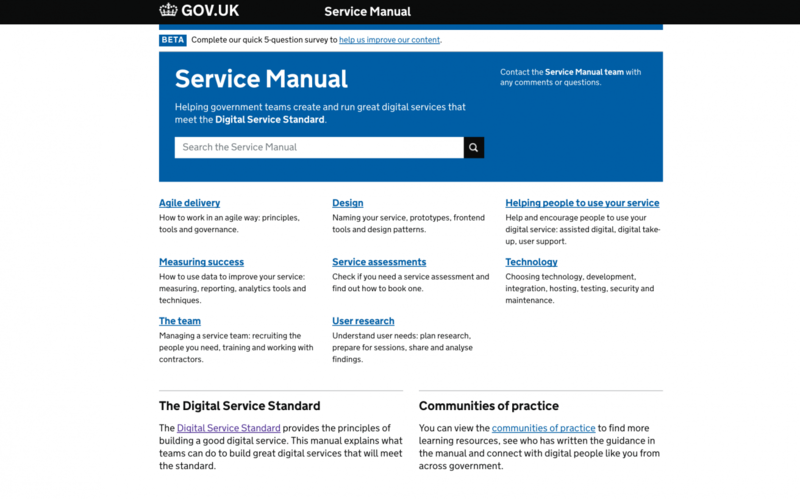 You can also subscribe to receive alerts for the Digital Service Standard (https://www.gov.uk/service-manual/service-standard). No longer sharing via github? Well that's a massive step backwards. One of the things that made gov.uk great was that that it made is easier for all the world to improve. Subscribe for notification by email - is this the 90s? What about seeing the history? What about being able to fork it and drive our own companies behaviours off this excellent example? If the driver for this was "but we need a CMS everybody could use" maybe you should have built that so that it pushes to GitHub? That would be helpful in lots of ways, to lots of people too. 100% retrograde step and upsetting to see on a project that has been such an inspiration. Sad times. Hi Oli, thanks for your comment. Feedback like this is useful as we continue to iterate the Service Manual. Change notes summarising updates are available for every page in the manual. We store a version history of each page, and can explore the need for displaying a full version history in future, as well as needs for content syndication. User research identified that while content management and engagement in GitHub was useful for some, it was a barrier to others and at alpha the team made the decision to build the new Service Manual on GOV.UK. This allows a full-time team of content designers to work with communities of practice across government to keep guidance up to date. The move to the GOV.UK platform also provides a robust tech support model and a development roadmap that the Service Manual will continue to benefit from.